The Coastal Bend Bays & Estuaries Program (CBBEP) is a local non-profit 501(c)(3) organization dedicated to researching, restoring and protecting the bays and estuaries of the Texas Coastal Bend. This 515 square mile area of water includes all bays, estuaries and bayous in the Copano, Aransas, Corpus Christi, Nueces, Baffin and upper Laguna Madre bay systems. The mission of the CBBEP is the implementation of the Coastal Bend Bays Plan, which is to protect and restore the health and productivity of the bays and estuaries while supporting continued economic growth and public use of the bays. The plan identifies specific actions that will benefit the bay system and the users of the bays. 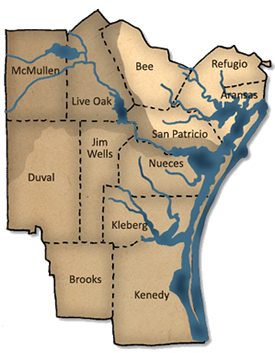 The Program area encompasses 75 miles of estuarine environment along the south-central Texas coastline and includes 12 counties of the region known as the Coastal Bend, extending from the land-cut in the Laguna Madre, through the Corpus Christi Bay system, and north to the Aransas National Wildlife Refuge.